Editor's note: CNN.com is streaming live from beginning to end the rescue attempts at a Chilean mine where 33 men have been trapped since August 5. Also, watch live coverage on CNN TV. Click here for full coverage of the Chile mine disaster. Follow our minute-by-minute updates on the continuing Chile mine rescues here. 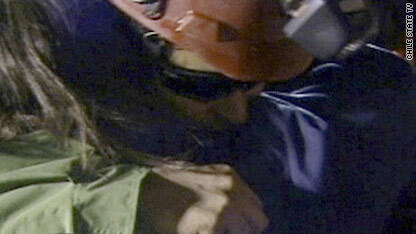 Claudio Yanez hugs his girlfriend, who proposed to him while he was trapped, after emerging from the rescue chamber. [Updated at 6:02 a.m. ET, 7:02 a.m. Chile time] Claudio Yanez' girlfriend kissed the mining minister as he arrived at the top of the rescue chamber, becoming the eighth miner to emerge after being underground for more than two months. Wearing glasses to protect his eyes from the change in light, Yanez ran towards his loved ones and engaged in a long embrace with his wife. He then went to hug his two daughters, the youngest who was crying and rubbing her father's back. He held his daughters as he went and thanked each rescuer one at a time. His family, including one of his daughters stood near by with bright smiles on their faces as they awaited his arrival. Claudio Yáñez is put into the rescue chamber. [Updated at 5:44 a.m. ET, 6:44 a.m. Chile time] Claudio Yáñez, 34, known as "the smoker" by the group because he asked for cigarettes during his time trapped in the mine, is being loaded into the rescue capsule. The mining minister had sent him a note back saying he would sent nicotine patches instead, but Yáñez insisted cigarettes please be sent down. During his time trapped underground, his longtime girlfriend proposed to him through a letter, and he also begged officials to send down photos of his two daughters. [Updated at 5:31 a.m. ET, 6:31 a.m. Chile time] The capsule has gone down to bring up Claudio Yáñez, who will be the eighth man put into the rescue chamber. Jose Ojeda proudly waves the Chilean flag as he steps out of the rescue capsule. [Updated at 5:22 a.m. ET, 6:22 a.m. Chile time] Jose Ojeda walked out of the capsule with a broad smile on his face and proudly holding up and waving the Chilean flag. Chants and whistles erupted from the site as he exited. He then went to his stepdaughter, kissing her on the cheek several times, as tears streamed down her face. As he walked over to thank and hug the miners, some of whom were wiping tears from their face, he kept his arm firmly around his stepdaughter. Ojeda, known for his short powerful note to the world signaling the miners were okay, served as the secretary of the trapped miners. [Updated at 5:20 a.m. ET, 6:20 a.m. Chile time] Jose Ojeda, who has been in the mining industry for 27 years, has just reached the top of the rescue tube. The 46-year-old widower is a diabetic and has had medicine sent down to him in a tube while he has been trapped in the mine. It was his postcard, with a 33 letter message, saying "We are well, the 33 miners," that has become a symbol of the miner's strength. As his journey through the tunnel reached the final third of the way, signaled by bells at the site, his stepdaughter became emotional, then a smile widening on her face as she waited to see her stepdad. Video from inside the mine shows the seventh man as he is being sent up the rescue chamber. [Updated at 5:02 a.m. ET, 6:02 a.m. Chile time] Video from the mine shows rescuers and the miners chatting, making jokes and reminding them to have patience as they prepare to load the seventh man, Jose Ojeda, into the rescue capsule. [Updated at 4:55 a.m. ET, 5:55 a.m. Chile time] Jose Ojeda, the man known for penning the message to the world: "We are well, the 33 miners," is expected to be the seventh man lifted out of the mine. The capsule has just gone back down the tube. It has been expected that the Chile's mining minister, who had gone to rest, would return to the site after Ojeda's rescue and return that precious message to him. [Updated at 4:43 a.m. ET, 5:43 a.m. Chile time] Flanked by family members, Mario Sepulveda - the second miner to be rescued - spoke to Chile's national broadcaster TVN Wednesday morning. Here are parts of his remarks: About his need for privacy: "The only thing I ask [of the public] ... is that we aren't treated like artists or as reporters. I want to continue to be treated as Mario Antonio Sepulveda Espinace, worker - a miner." About his time underground: "I was with God and I was with the Devil. They fought and God won." About the need for better work conditions: "Things can't stay the way they've been. Many changes must be made." Osman Araya hugs his wife Angelica Ancallpo after exiting the rescue chamber. [Updated at 4:23 a.m. ET] As Osman Araya was taken out of the capsule, the 30-year-old hugged and shook the hands of rescue workers, before heading to greet his wife Angelica Ancallpo. Araya held her in a tight hug as he said "I love you," and gave her several kisses. As Araya, who has four children, including a one-year-old, was put on a stretcher and taken away he looked at the camera and held both thumbs up. 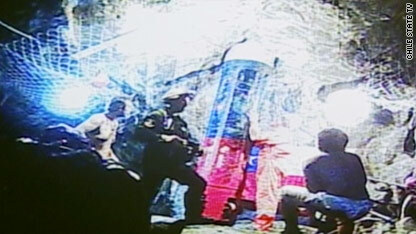 Osman Araya is helped out of the rescue capsule. [Updated at 4:23 a.m. 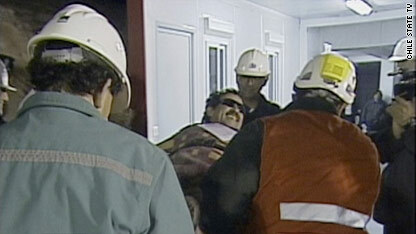 ET] Osman Araya, the sixth miner, has reached the surface and is being taken out of the rescue capsule. His wife Angelica Ancallpo is standing in the crowd, filled with emotion, waiting to embrace her husband. [Updated at 4:16 a.m. ET] The rescue capsule has reached the mine. Osman Araya, a carrier pigeon handler, is expected to be the next miner headed to the surface. Another rescue worker is loaded into the rescue capsule. [Updated at 4:05 a.m. ET] Crews believe they have resolved the issue with the capsule and are set to send it back down into the mine. [Updated at 3:45 a.m. ET] Mario Sepulveda, the second miner rescued from underground, praised his rescuers and pushed for better work conditions in Chile. "Things can't stay the way they've been," he said, while sitting beside members of his family. "Many changes must be made." [Updated at 3:35 a.m. ET] Crews are working on the wheels of the capsule. Rescue attempts are briefly on hold as they work on the capsule. 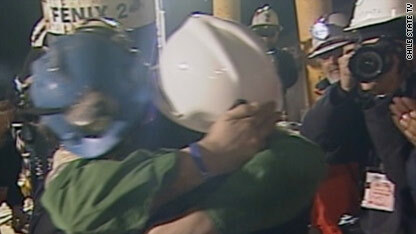 Jimmy Sanchez, the fifth miner rescued from a Chilean mine, gets a big hug from his father. [Updated at 3:25 a.m. ET] A government official says a helicopter believed to be carrying four rescued miners has left the area. [Updated at 3:15 a.m. ET] Jimmy Sanchez arrives at the surface and receives a hug from his father. The environmental assistant does not like confined spaces and has said he misses his mother's cooking. [Updated at 2:56 a.m. ET] Rescuers have begun lifting a fifth miner, Jimmy Sanchez, 19, to the surface. Sanchez is the youngest of the 33 miners. The fourth rescued miner, Carlos Mamani, 23, walks away from the capsule that brought him to the surface. [Updated at 2:17 a.m. ET] Chilean President Sebastian Pinera still is at the site, and he greeted the Bolivian miner, Mamani, as he did the three Chilean miners who were rescued before him. Mamani also was greeted by other officials, rescuers and a loved one. Mamani, like the three who were rescued before him, wore sunglasses that had been sent to the miners' refuge. The miners are being instructed to wear the sunglasses to protect their eyes on the surface, where they will be exposed to more light than they've been used to underground. Bolivian President Evo Morales has promised to help Mamani after he is rescued. Twenty-nine miners - all Chilean - remain underground. [Updated at 2:09 a.m. ET] The fourth rescued miner, Carlos Mamani, 23, has been lifted to the surface. Mamani, a Bolivian and only non-Chilean in the mine, had been working in the mine for only five days when the collapse happened. His father-in-law told reporters before today's rescue that Mamani decided never to work in a mine again. [Updated at 1:45 a.m. 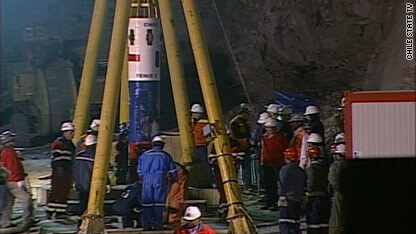 ET] The rescue capsule has again been lowered to the miners' refuge 2,300 feet below the surface. A fourth miner - Carlos Mamani, a 23-year-old Bolivian, is about to be rescued. Mamani is the only non-Chilean who was trapped in the mine. We forgot to note that a third rescuer, Patricio Robledo, was lowered to the miners' refuge before the third rescued miner, Juan Illanes, was lifted to the surface. So, three rescue workers are assisting the miners who are awaiting their trip home. remains, we pray that by God's grace, the miners will be able to emerge safely and return to their families soon." The third rescued miner, Juan Illanes, smiles early Wednesday as he is wheeled on a gurney to a triage center. [Updated at 1:18 a.m. ET] Illanes, like the other two rescued miners before him, embraced his spouse, Chile's president and others. He smiled as workers cheered him while he was being wheeled on a gurney to the nearby triage center. While he was underground during the 68-day ordeal, Illanes, an electrical mechanic, became known as someone who liked to sing and was good at it. His letters to his wife displayed humor and optimism. [Updated at 1:08 a.m. ET] The third rescued miner, Juan Illanes, 52, has been brought to the surface. [Updated at 1:06 a.m. ET] The father of the first trapped miner pulled to safety after more than two months underground told Chile's TVN he is proud of his son and eagerly awaiting the arrival of a second son, still trapped nearly half a mile beneath the earth. "I'm very proud of him. Thanks to God he got out and looks good," Alfonso Avalos said about his son, Florencio Avalos, soon after the latter stepped out of a rescue capsule at about 11:13 p.m. ET Tuesday. The second son, Renan Avalos, 29, remains trapped. [Updated at 1:03 a.m. ET] We now have video of the second rescued miner, Mario Sepulveda, embracing his wife and Chile's president and celebrating his rescue. Also, Chilean President Sebastian Pinera praised the rescuers after the first miner, Florencio Avalos, was brought to the surface. "We had promised to look until we found them," he said, speaking outside the mine. "We can all feel proud to be Chilean." [Updated at 12:49 a.m. ET] The third rescue attempt is under way. Juan Illanes, 52, is aboard the capsule, and it is being lifted to the surface. Again, this should take about 15 minutes. [Updated at 12:41 a.m. ET] The capsule has been lowered to the miners' refuge again. We're awaiting the rescue of a third miner. [Updated at 12:23 a.m. ET] A little more about the second rescued miner, Mario Sepulveda: After he exited the rescue capsule, he reached into a large yellow bag and handed out what appeared to be rocks to officials and rescue workers. Sepulveda cracked jokes in his first moments above ground and led a crowd in a cheer for Chile. As the 40-year-old was hauled away on his stretcher for a medical evaluation, he asked his wife, "How's the dog?" [Updated at 12:16 a.m. ET] A smiling and jubliant Mario Sepulveda - the second rescued miner - embraced his wife and Chile's president, among many others, upon leaving the rescue capsule. At one point, he ran to a group of people who had been cordoned off from the immediate rescue area and cheered his rescue with them. He waved, grinned and pointed to people as he was taken into a nearby triage center for his medical checkup. [Updated at 12:09 a.m. ET Wednesday] A second miner, Mario Sepulveda, has been lifted out of the rescue shaft. [Updated at 11:58 p.m. ET] The wife of Mario Sepulveda - who is in the process of being the second miner to be rescued - is being escorted to the area where the rescue capsule will surface. [Updated at 11:55 p.m. ET] The rescue of the second miner has begun. 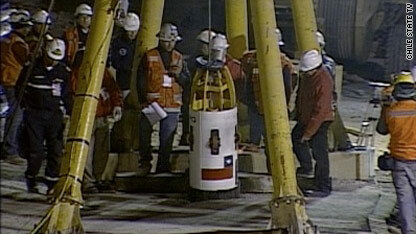 The rescue capsule, carrying miner Mario Sepulveda, 40, is being lifted to the surface. If the first rescue is any indication, it may take a little more than 15 minutes to bring Sepulveda up. [Updated at 11:52 p.m. ET] Chilean President Sebastian Pinera, who is at the rescue site on the surface, reacts to the safe rescue of the first of 33 miners: "We had promised to look until we found them. We can all feel proud to be Chilean." [Updated at 11:45 p.m. 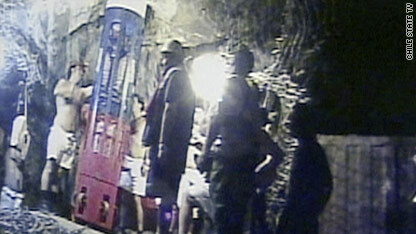 ET] The capsule - carrying rescuer Roberto Rios - has been lowered into the miners' refuge. Rios is now the second rescuer in the refuge, where 32 miners still are waiting for their trip to the surface. The first rescued miner - Florencio Avalos - was brought to the surface more than a half-hour ago. Video of Avalos' arrival on the surface - and the greeting that his wife, Chile's president and others gave him - is now available. Rescued miner Florencio Avalos, 31, hugs his wife at about 11:13 p.m. ET, moments after leaving the capsule that brought him to the surface. [Updated at 11:30 p.m. ET] Forget about waiting to be examined at the triage center before greeting family members. When rescued miner Florencio Avalos left the capsule more than 15 minutes ago, his wife was among those who embraced him before he was stretchered away. Avalos served as a cameraman during his time in the refuge, filming videos of the miners to be sent up to rescuers and relatives at the surface. His brother, Renan Avalos, is among the 32 miners still in the mine. [Updated at 11:28 p.m. ET] The descent of the second rescuer, Roberto Rios, has begun, 17 minutes after the first miner, Florencio Avalos, was rescued. 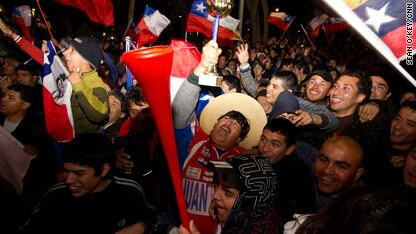 People in Copiapo, Chile, react to the rescue of Florencio Avalos. [Updated at 11:24 p.m. 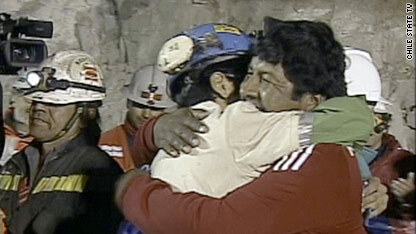 ET] With one miner out and 32 to go, a second rescuer, Roberto Rios, will be lowered into the miners' refuge. Workers are helping Rios into the capsule - which can carry only one person at a time - right now. 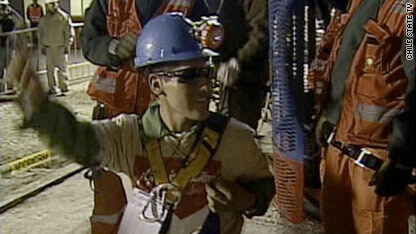 Rios presumably will help the rescuer who already is in the refuge, Manuel Gonzalez, assess the remaining miners and manage the rest of the rescue process. [Updated at 11:13 p.m. ET] Rescuers clap and cheer as the first miner to be rescued, Florencio Avalos, 31, leaves the capsule and steps onto the surface for the first time in about 68 days. After hugging several people, he is put on a stretcher and wheeled into a nearby triage center. [Updated at 11:11 p.m. ET] The first of 33 miners who were trapped in the mine more than two months ago has been rescued. 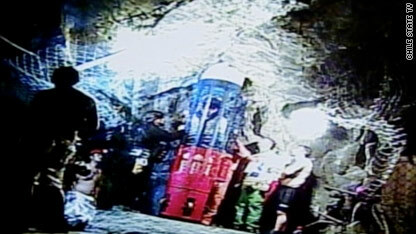 The rescue capsule carrying Florencio Avalos reached the surface about 16 minutes after the ascent from the miners' refuge 2,300 feet below the surface began. Avalos is the first miner to be rescued. [Updated at 10:55 p.m. ET] The first attempt to bring up one of the 33 trapped miners has begun. The capsule - carrying 31-year-old Florencio Avalos - is being lifted to the surface. The trip may take less than 15 minutes. [Updated at 10:53 p.m. ET] The first miner - believed to be 31-year-old Florencio Avalos - is in the capsule. We're waiting for the lifting to begin. As a miner is being taken to the surface, his family will be waiting in a tent near the rescue site on the surface. When the capsule reaches the surface, the miner will be taken to a temporary triage center so medical personnel can check him. Then, both the miner and his family will be taken to a nearby building for a brief reunion. After the reunion, the miner will be flown by helicopter to a medical center. [Updated at 10:38 p.m. ET] Some of the trapped miners hugged rescue worker Manuel Gonzalez after he exited the capsule that took down him 2,300 feet from the surface to the miners' refuge, video from inside the refuge shows. Gonzalez is now talking to the miners. One of the miners - expected to be 31-year-old Florencio Avalos - will soon be put inside the capsule so he can be lifted out. [Updated at 10:36 p.m. ET] The capsule carrying rescue worker Manuel Gonzalez has reached the miners' refuge, video from inside the mine shows. His descent took 17 minutes. [Updated at 10:19 p.m. ET] The capsule - with rescue worker Manuel Gonzalez inside - has been lowered into the rescue shaft. Chilean President Sebastian Pinera and rescuers clapped and wished Gonzalez good luck as his journey began. 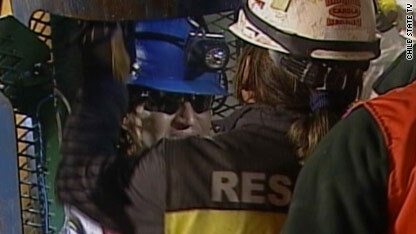 The plan is to lower Gonzalez into the miners' refuge, about 2,300 feet below the surface, and then have him prepare one of the 33 trapped miners to be raised to the surface. Chilean Mining Minister Laurence Golborne has said he hoped at least one miner will be brought to the surface by midnight local time, which would be 11 p.m. ET. To get an idea of the path that the 924-pound rescue capsule will take, check out this interactive graphic, which also includes information about each of the 33 trapped miners. It will be updated throughout the rescue to reflect which miners have been lifted to the surface. [Updated at 10:12 p.m. ET] Rescue worker Manuel Gonzalez has been entering and exiting the capsule and making adjustments inside as preparations to lower him into the rescue shaft appear to be under way. Chile's president was seen speaking to him shortly before these preparations began. [Updated at 10:07 p.m. ET] Repairs appear to have been made to the rescue capsule after its access door was damaged during a test run, and another test appears to be under way. 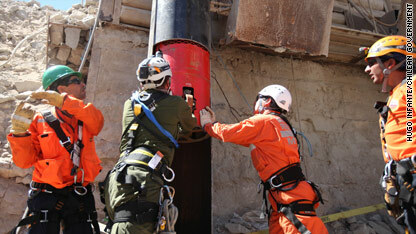 In fact, the capsule already is being taken back out of the rescue shaft. 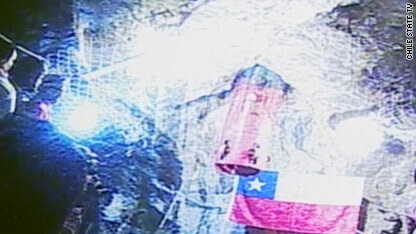 Chilean President Sebastian Pinera has gone to the area of the rescue shaft, possibly indicating that a rescuer will be lowered into the capsule soon, CNN's Karl Penhaul reports. The unoccupied capsule is lowered into the rescue shaft shortly after 8:30 p.m. ET Tuesday as part of final testing. [Updated at 9:50 p.m. ET] A rescue official has told Chilean state TV that the capsule's access door was damaged during a test in which the capsule was lowered into the rescue shaft. "There was some small damage to the access door, which is what they are fixing right now," Jorge Sougarret told TVN. "Now they will regulate the tension so they can give the wheel more tension, and obviously solve the issue with the door." [Updated at 9:39 p.m. ET] Thousands of Chileans have gathered in the town square of Copiapo, Chile, not far from the mine, to watch live video of the rescue efforts on an enormous projection screen, CNN's Sean O'Key reports. [Updated at 9:23 p.m. ET] Here is video of the capsule being lowered into the rescue shaft as part of the final test before the miners' rescue begins. As noted below, the test began at 8:33 p.m. ET. 1) Florencio Avalos, 31, who recorded the videos - sent up to the surface - that showed the world what conditions inside the mine have been like; 2) Mario Sepulveda, 40, who has served as a narrator in the videos; 3) Juan Illanes, 52, an electrical mechanic; 4) Carlos Mamani, 23, a Bolivian and the only non-Chilean in the mine; 5) Jimmy Sanchez, 19, the youngest in the mine; 6) Osman Araya, 30; 7) Jose Ojeda; No. 8, Claudio Yanez, 34; 9) Mario Gómez, 63, the oldest in the mine; 10) Alex Vega, 31; 11) Jorge Galleguillos, 56; 12) Edison Pena, 34; 13) Carlos Barrios, 27; 14) Victor Zamora, 33; 15) Victor Segovia, 48; 16) Daniel Herrera, 27; 17) Omar Reygadas, 56; 18) Esteban Rojas, 44; 19) Pablo Rojas, 45; 20) Dario Segovia, 48; 21) Yonni Barrios, 50; 22) Samuel Avalos, 43; 23) Carlos Bugueno, 27; 24) Jose Henriquez, 54; 25) Renan Avalos, 29; 26) Claudio Acuna; 27) Franklin Lobos, 53; 28) Richard Villarroel, 27; 29) Juan Carlos Aguilar, 49; 30) Raúl Bustos, 40; 31) Pedro Cortez, 25; 32) Ariel Ticona, 29; 33) Luis Urzua, 54, a shift foreman whose voice rescuers first heard when voice contact was made. The unoccupied capsule is lowered into the rescue shaft at 8:33 p.m. ET Tuesday as part of final testing. [Updated at 8:33 p.m. ET] The capsule has been lowered - unoccupied - into the rescue shaft as part of final tests before the miners' rescue begins. After the tests, the capsule will lower rescue personnel to the miners' refuge about 2,300 feet below the surface, one at a time. Chilean Mining Minister Laurence Golborne has said he hopes at least one miner will be brought to the surface by the end of the day. [Updated at 8:24 p.m. ET] The capsule is dangling above the rescue shaft, and we're awaiting word on when a rescuer will be lowered into the miners' refuge. 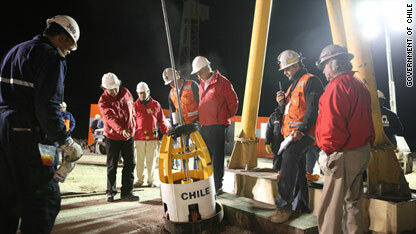 Chilean Mining Minister Laurence Golborne had said tests would be done before the rescue effort will begin. [Updated at 8:14 p.m. ET] Less than an hour to go before rescuers may begin lowering fellow rescuers to the miners' refuge via the capsule that will be used to lift the miners to the surface, according to a timeline given earlier by Chilean Mining Minister Laurence Golborne. To get an idea of the path that the rescue capsule will take between the surface and the miners' refuge, check out this interactive graphic, which also includes information about each of the 33 trapped miners. It will be updated throughout the rescue to reflect which miners have been lifted to the surface. Also, this video shows the inside of the capsule and some of the preparations that rescuers were making earlier today. [Updated at 7:42 p.m. ET] At least another 80 minutes to go before rescuers may start to lower the rescue capsule to the miners, according to a timeline given earlier by Chilean Mining Minister Laurence Golborne. CNN's Dr. Sanjay Gupta discusses the health risks that the miners face during and after their rescue, including issues such as the condition of their lungs and changes in pressure. [Updated at 7:12 p.m. ET] Tests will begin at the San Jose mine in Chile using the rescue capsule before the actual rescue, Mining Minister Laurence Golborne said. He estimated it would be at least two hours before the rescue effort starts. [Updated at 7:01 p.m. ET] It will be at least another two hours before rescuers will lower the capsule half a mile below the ground to the miners, Chilean authorities say. Meanwhile, the first four miners to be rescued have been identified, according to CNN Chile: Florencio Avalos, Mario Sepulveda, Carlos Mamani and Juan Illanes. [Updated at 6:41 p.m. ET] A mining rescuer will be the first person to descend, followed by a medical specialist, officials say. Meanwhile, a UCLA emergency has talked to CNN about medical challenges that the miners could face during and after their rescue. [Updated at 6:25 p.m. ET] The miner who recorded the daily activities of the trapped miners in Chile will be the first one rescued, Chilean President Sebastian Pinera says. The world will be watching as Florencio Avalos, 31, is extracted from the San Jose mine after 68 days of captivity, together with 32 others. [Updated at 6:07 p.m. ET] The first member of the rescue team is expected to be lowered into the shaft around 7 p.m. ET/8 p.m. local time. A team of paramedics and rescuers will go down first to assess the situation. Each miner will be hauled up in a capsule wearing an oxygen mask for the 2,000 feet ascent, which is expected to take around 15 minutes per person. 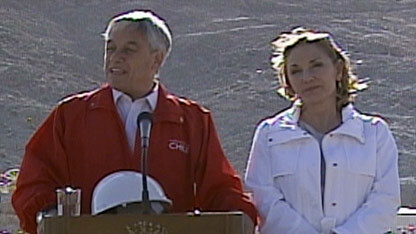 Chilean President Sebastian Pinera speaks to reporters Tuesday at the San Jose mine. [Updated at 4:45 p.m. ET] President Sebastian Pinera arrives at the San Jose mine site Tuesday afternoon and tours the area before the start of the rescue. "Today's the end of a long journey," Pinera said. "This story started as a possible tragedy, and we hope that it ends as a blessing." Chile is a country that reacts well to adversity, the president said, addressing the crowd of international media that has gathered for the event. Even so, he noted that the miners would not be the same once they emerged, just as the ordeal has had a profound effect on Chile. Chilean rescue workers will be using this chamber to try and bring each miner up to the surface. [Posted at 4:00 p.m. ET] After 68 days trapped underground in a mine in Chile, workers are prepared to begin rescuing the first of the 33 men. Earlier in the day the concrete base built for the winch system at the San Jose Mine has hardened, paving the way for the rescue of the miners to start tonight, Mining Minister Laurence Golborne said. The winch that will pull the trapper miners out in Chile will extract them at .7 meters (2.3 feet) per second, Health Minister Jaime Malanich said. In case of emergency, the speed of ascension can be increased to 3 meters (9.8 feet) per second. OMG–Could Eliot Spitzer STOP TALKING! I want to hear what the President of Chile is saying to the last miner....and I cannot believe how they are talking and talking and talking. CNN has had the worst coverage of this event – self-seving reporters talking about how great THEY are, no translators, some guy at the hospital talking over the pictures of the last miner up and, my personal favorite, Larry King ridiculously trying to make a connection between Mr. Sepulveda and Sepulveda Blvd. in Los Angeles. Oh, really?